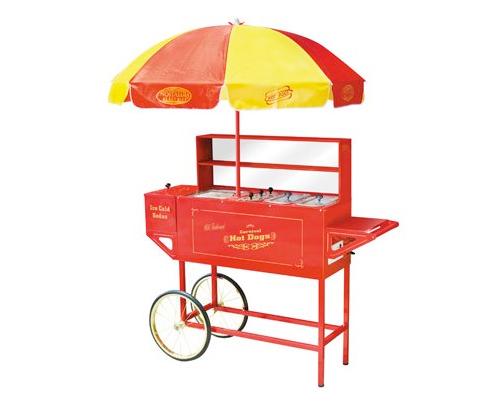 The Nostalgia Electrics Vintage Collection Carnival Hot Dog Cart with Umbrella has all you need to replicate the hot dog experience whenever (and wherever) you desire. Featuring commercial grade construction, the eye-catching enameled steel unit is sure to inspire hunger at first sight. No matter what your topping preferences, this hot dog cart has you (or rather, your hot dog) covered. In addition to the heated roller which holds up to eight hot dogs, steam compartments keep buns (and additional hot dogs) warm and at the ready. Three condiment inserts supply storage for onions, sauerkraut and the ever-essential sliced jalapeños. To wash it all down, a built-in beverage cooler is integrated at the end. The $499 price tag may be off-putting, but with the cold winter months ahead, consider it an investment against all the traveling in inclement weather to track down a hot dog. Add to that the price of the hot dog, and it’s easy to see the benefits of having one of these in your own backyard. Really, this cart pays for itself.